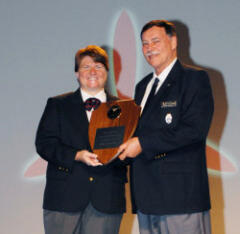 Col. Roy Douglass (Right) accepts Turner Award from Maj. Gen. Amy Courter at the CAP National Conference. in the safety portion of last December’s compliance inspection, the wing was recognized for providing to all unit Safety Officers a CD containing a sample continuity book, suggested seasonal briefing items, numerous wing-developed briefings, copies of current regulatory guidance and forms, historical reports, the North Carolina state driver’s handbook and programs that ensure each member can receive the required face-to-face briefings. Another wing benchmark is a separate safety tab on its Web site, where viewers can access monthly wing-required safety briefings online and respond directly to the Wing Safety Officer by e-mail. The wing was also commended for its mission Safety Officer guide, a required portion of the operations approval process that logs safety planning and documents specific execution; a reporting log that tracks all incidents, includes additional required reports and provides for trend analysis; and a safety program for cadets that mandates safety training as prerequisites for various grade advancements and brings them into the wing’s safety culture. The North Carolina Wing’s safety program is based on Operational Risk Management unique to its missions of air and ground operations. Points are added for anticipated mission risks, such as equipment, weather, time of day, topography and urgency. The wing is strict about safety requirements, and its units are held accountable if the requirements are not met. These requirements include mandating all aircraft custodial units to perform a first-of-the-month inspection to ensure airplanes are always ready to respond, designating a cadet Safety Officer for all cadet and composite squadrons and holding a safety briefing at every meeting. The wing itself uses a safety directorate consisting of the wing’s Safety Director and subordinate air and ground Safety Officers. The North Carolina Wing even tracks accidents in other wings to learn from them. When a CAP aircraft accident occurred in terrain similar to western North Carolina’s, the North Carolina Wing required its own Form 5 qualified pilots to complete an online mountain flying course and to provide a copy of their completion certificates before they would be allowed to fly wing aircraft.